No. 17 Princeton University visited New Balance Field on Sunday and scotched No. 24 Boston University’s perfect record on their home turf with a 1-0 win. The Terriers now move to 5-4 on the season, but still stand 1-0 in Patriot League play. It was the first back-to-back for the Terriers this season, and temperatures teased the high 80’s throughout the contest. Nevertheless, BU did not lose this one due to fatigue or lack of effort. The smothering Tigers defense was the story of the afternoon. 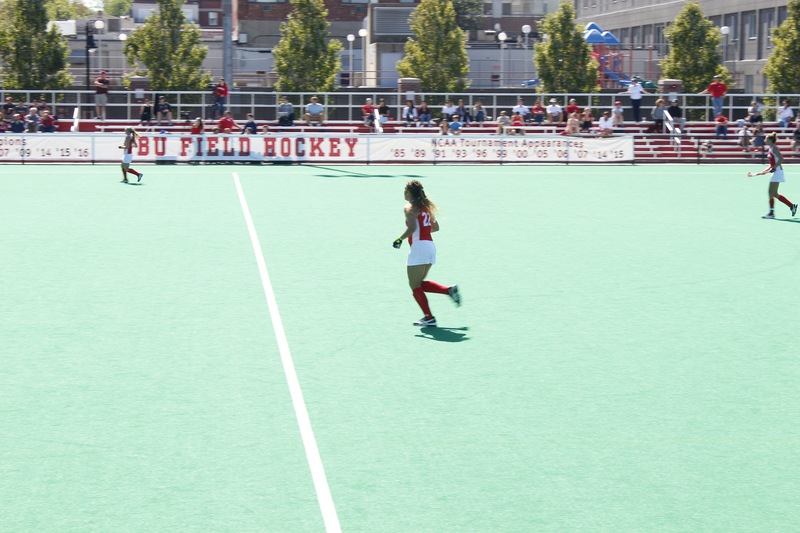 The Terriers were limited in the number of good looks they had at the goal, ultimately finishing with just four shots in their first scoreless outing of the season. BU’s freshman goalkeeper Millie Baker made her first collegiate start Sunday. Head Coach Sally Starr decided to deviate from her typical mindset of starting junior Kathleen Keegan, with Baker as the usual second half substitute. However, Baker did not make it obvious that she found herself in a new role. She recorded two saves – one coming from a terrific dive to her right side to hit the ball away with her stick at the last second – and allowed no goals during her 35 minutes of action. In the second half, Keegan protected the cage for BU. Despite three saves, Keegan conceded a Tiger goal in the 49th minute. Princeton midfielder Maddie Bacskai was able to score after the Terriers failed to defend off a penalty corner. Penalty corners have been an area of struggle for this 2017 BU team, both on the offensive and defensive ends. On Sunday, the Terriers gave up four corners while earning none. Still, the Terrier’s defense did have its moments of success. Princeton’s point leader Ryan McCarthy – 14 pts on 6g, 2a – was held scoreless on four shot attempts. BU is now 0-3 against ranked teams so far this season, a story that may negatively affect the Terriers if they end up needing an at-large bid come playoff time. BU will return to Patriot League action Friday, Sept. 29 at Colgate (2-7). Last season, the Terriers shut out the Raiders, 9-0. The game will start at 4 p.m. in Hamilton, New York.